This is a review of the 2016 Acer Chromebook 15, for our impressions of the latest model, be sure to check out our 2017 Acer Chromebook 15 review. Chromebooks have become completely cemented in the small notebook market. Through the last several years, manufacturers have been working on perfecting their cloud-based offerings and have released some truly mind-blowing laptops, such as the premium 11-inch Samsung Chromebook 2 and 13-inch Toshiba Chromebook 2, one of the first models with a gorgeous 1080p display. Today, we have something fresh, yet somehow very familiar in front of us with the the world's first 15-inch Chromebook from Acer. 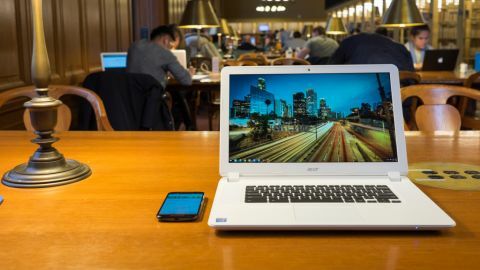 Aptly named the Acer Chromebook 15, this machine is not only the largest Chrome OS notebook ever made, it's also the very first that's come equipped with Intel's 5th generation Celeron processors. Despite all these changes, the Chromebook 15 still comes at a very affordable $349 ( £249, about AU$458). That’s far less than the $500 that you’d usually spend on a budget Windows laptop, and well, this Acer laptop has quite a few features that will turn your head and make you consider it above all others. In a market that’s filled with so many 13-inch Chromebooks, the Acer Chromebook 15 looks downright gigantic. Obviously a laptop this big for this price will mean way more plastic, but Acer has really done a fantastic job at making this Chromebook feel firm and robust. The laptop's entire plastic exterior is also enclosed in a net-like texture. The entire laptop has been given this finish including the lid, bottom and the backside of the screen hinges. So, no matter how you're carrying around the Chromebook 15, you won’t have to worry about losing your grip. This woven finish also just feels much warmer than a slab of smooth plastic. Open up the laptop, and you'll be greeted with a massive, 15.6-inch display that somehow absorbs any light that hits it entirely and dissipates it, eliminating any reflections or glare. Acer calls this its ComfyView anti-glare display, and it's much easier on my eyes. Even with the screen turned off, it resembles something more of a dark satin sheet compared to the mirror like sheen that comes off other notebooks outfitted with with glossy panels. Just underneath this beautiful screen, you'll find even more space for activities. The spacious keyboard deck leaves plenty of room for a full-size keyboard without any truncated tilde keys or short shift bars. I would have loved to see a number pad as well, but Acer reserved the space for two large speaker grills on each side of the keyboard. Towards the bottom there's also a large trackpad, which – not unlike the new MacBook – will click in no matter where you press on it. You'll want to be careful about pressing in too deeply around the trackpads two bottom edges, though, as it bends a few millimeters beneath the palm rests.